From Rural Village to Global Village: Telecommunications for Development in the Information Age examines the role of information and communication technologies (ICTs) on both the macro level--societal, socio-economic, and governmental--and sector level--education, health, agriculture, entrepreneurship--emphasizing rural and developing regions. Author Heather E. Hudson examines the potential impact of ICTs by reviewing the existing research and adding her own findings from extensive fieldwork in ICT planning and evaluation. The volume includes case studies demonstrating innovative applications of ICTs plus chapters on evaluation strategies and appropriate technologies. She also analyzes the policy issues that must be addressed to facilitate affordable ICT access in rural and developing regions. This discussion relates to the larger “digital divide” issue, and the impact that access to communication technology--or the lack of it--has on communities and societies. This comprehensive volume is a valuable resource for scholars, professionals, researchers, and students in telecommunications law and policy, media economics, international communication, and communication and development fields. It is also suitable for use as an advanced-level text in these areas. Contents: The Death of Distance? 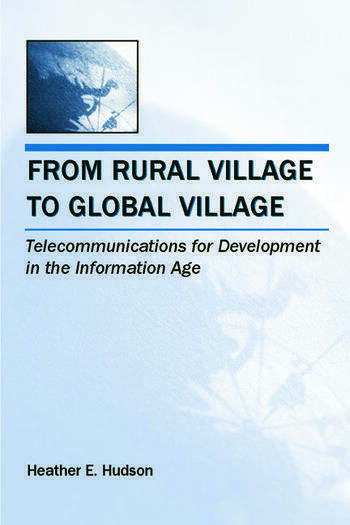 Telecommunications and Rural Development. Applications of ICTs for Education and Training. Telemedicine and Telehealth: Applications of ICTs for Health Care Delivery. Digital Divides: Gaps in Connectivity. Toward Universal Access: Strategies for Bridging Digital Divides. Technologies for Extending Connectivity. Restructuring the Telecommunications Sector in Developing Regions. Evaluation: Issues and Strategies. From Global to Local. A Selection of Useful Web Sites on ICTs and Development. Heather Hudson (PhD Stanford) is the director of the Telecommunications Management & Policy program in the School of Business and Management at the University of San Francisco. She is one of the best known and regarded scholars working in telecommunications policy. She has authored six books, and published numerous chapters and articles. "Crafting a book that is highly readable, concise, well-documented, and useful to a broad professional and academic audience is a challenging task. Professor Hudson clearly meets the challenge."